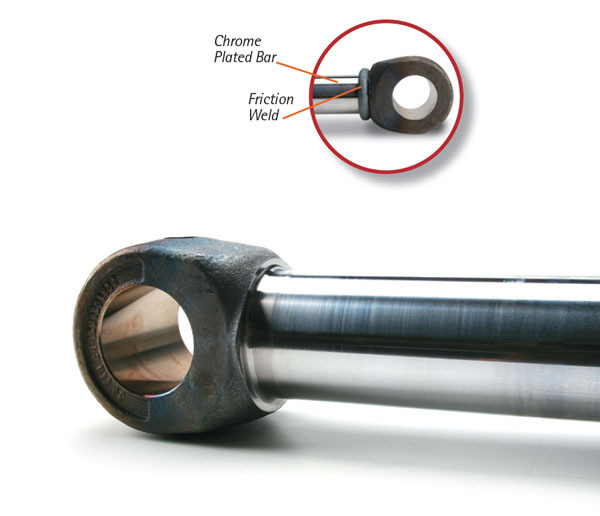 One of the main advantages of using a friction weldment is the ability to create a full surface bond that will be as strong as the parent material. When high strength is warranted in such a part we tend to take the approach that this is a life-critical part, meaning if the part fails there could be safety hazards posed to equipment operators resulting in your worst case scenario. We had been producing cylinders for years for a client that built lifting equipment. We were told later that they had decided to take their business to a competitor to get a better price. In order to achieve this reduction in cost, the friction welder decided to decrease the amount of material burn off so that there would be less weld flash to remove, thus decreasing the time the parts spent in the welder and lathe. Six months later we received a call from our former client in dire need of replacement parts. The parts welded by our competitor were suddenly failing in the field. We were up and running with new parts before the root cause of failure was discovered. Turns out that reducing the length loss by a small percentage was enough to send this program into a panic. Again, by not burning off as much material, our competitor was able to save time and money on removing the weld flash in a machining operation. This probably saved our customer in the neighborhood of $40,000 in the short term. And mind you, these parts were being run on state of the art equipment. However, this one decision to tweak the parameters that were already validated, in an effort to save $40,000, ended up costing this client $600,000 as the entire annual volume of parts needed to be recalled and scrapped since there was no traceability on the parts. So, why am I telling you this today? Operating state of the art scheduling, weld monitoring, and graphing systems. And two, we refuse to compromise for the sake of cost reduction. No matter the size or scope of your component, AFW will treat it as a life critical to your company’s operation. We truly believe that your success is our success.